A digital artwork with slices of five images arranged in a fan. From left to right they are: a photograph of a character sheet with blue dice and a green pencil, The International Symbol of Access (a blue background with a white stylized image of a person in a wheelchair), a chaotic pile of dice in many colors and styles, splattered rainbow paints with a black and white drawing of a brain on top, and miniature houses with figurines of people in action poses. Any time I am running a game or writing a story, I want to create a diverse cast of characters. With so many different types of oppression and identities to be aware of, this is something that takes a bit of thought and intention. Trying to think about every type of oppression at once can be overwhelming. What I do instead is write out a list of the cast of characters and go through and assess each type of representation individually, making changes as necessary. This article is the list of different questions I ask myself when I’m doing this assessment process. I made this list thorough because I want it to be useful for a wide range of different projects. Because of this, some questions will not be applicable to certain projects. In addition, it is not always possible to include every type of representation in a particular project, especially for projects with small numbers of characters. What matters is being intentional about who is included and noticing any trends that develop from project to project. Also, please keep in mind that the medium being used (text, images, etc.) will affect which identities are easy to depict clearly and which take more effort (especially for minor characters). When identities are harder to depict, it is important to resist the temptation to fall back on stereotype. How many women are there? And how many men are there? Are any of the men or women depicted stereotypically? For those who want more information on representing transgender and nonbinary characters, check out the “Gender and the Gaming Table” article series by M Grant. How many characters are transgender? How many characters are nonbinary? Are some of the trans and nonbinary characters people of color? Are stereotypes being avoided in the depictions of these trans and nonbinary characters? I’ve written about tools that make the process of transcribing podcast episodes easier (Otter.ai and YouTube), but it is also important to know what to transcribe and how the finished transcript should look. That’s what this style guide is for. Because style guides can be a bit abstract, all of the information in this style guide is presented in three ways. Written explanations are given in the “How to Write and Format a Transcript” section. These instructions are repeated as a template in the “Transcript of Podcast Episode Title” section. Finally, an example transcript that demonstrates all of the things talked about in the previous sections is given in the “Transcript of Writing Alchemy Episode 100 – Imaginary Game Part 1” section. To make things easier, this article is also available as a word document: General Style Guide for Podcast Transcription. Before we get started, I want to make it clear that there isn’t as single best way to do podcast transcripts. This style guide contains common practices for making transcripts clear, informative, and readable. You don’t have follow the exact format given here. Do what works for you. What matters most is readability and consistency within the transcript. If you would like an alternative explanation for how to format transcripts, I recommend checking out “The Podcaster’s Guide to Transcribing Audio” by the folks at the Join the Party Podcast. When deciding the exact format of the podcast transcript that will work best for you, it is helpful to know how you will be posting the transcript. For example, for maximum accessibility, the Writing Alchemy episode transcripts are posted in four different formats. Because one of these formats does not show bold text, participant names in Writing Alchemy transcripts are written in all caps. Please note that this article contains general advice for podcast transcripts. For those interested in the Writing Alchemy specific style guide, that can be found here: Writing Alchemy Transcript Style Guide. 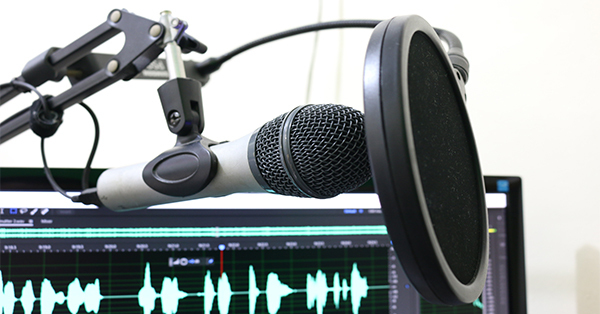 Photograph of a microphone being held up in a stand with a pop filter in front of it. In the background is the top of a computer screen displaying an audio editing program. Write the name of the person who is talking in bold, followed by a colon, and then what was said in the regular font style. Note that there are different ways of doing this formatting (for example, using all caps instead of bold). Do what works for you. What matters most is readability and consistency within the transcript. Make a new paragraph each time a new person speaks, or if a person switches between talking as a character and talking as themselves. Don’t indent paragraphs. Instead, format the transcript document to automatically have a space after each paragraph. Note that this is particularly helpful if posting the transcript on a website, as many websites automatically add spaces after paragraphs. Doing this helps avoid situations where extra spaces are put into the transcript that will need to be deleted once it is on the website. Descriptions of music, sound effects, and other important sounds (like dice rolling, group cheers, and sounds that are commented on) are written in brackets on their own line. Note that background sounds that no one reacts to are usually ignored. Expressive sounds that are part of talking, like gasps, sighs, and laughter are described in brackets in the same line as the talking they go with. Brief descriptions of unusual ways of speaking, such as whispering, squealing, or talking in a silly voice, are written in brackets right before the words that were said in that manner. 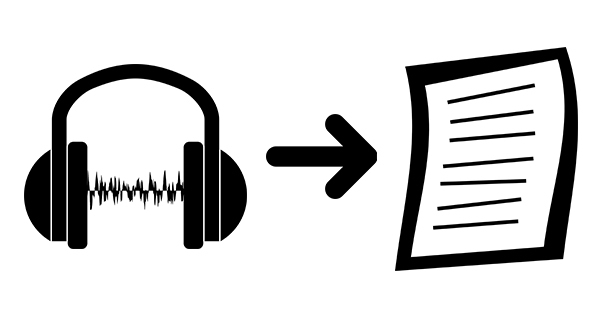 Black and white clip art depiction of audio being turned into a transcript. On the left, the sound is depicted by a pair of headphones with an audio wave going between the two ears pads. A simple black arrow goes from left to right. On the right, the transcript is represented by a stylized typed document. In order to make these transcripts as accessible as possible, each one is produced in four formats: as an online post for access convenience, in a word document with a low vision friendly font (Veranda), in a pdf with a dyslexia friendly font (OpenDyslexic), and a low contrast blue on black pdf as an access option for people with migraines (Veranda). Note: ‘*’ is used to indicate music and sound effects that were added to the recording. TOBI: You are listening to Writing Alchemy, stories that step outside the oppressive grind of the everyday world with your host, writer and artist Fay Onyx. FAY: Meet D’Zân [Note: pronounced duh-zahn] the weredragon druid in this character introduction episode. D’Zân is a student at the celebrated Adventurers Academy, and right now xe is studying creative problem-solving. Join xem for a surreal training exercise where xe swims through a sky full of sharks. FAY: Hello and welcome to Writing Alchemy Bonus Cast Number Five. I’m Fay Onyx, and today’s episode is about the new podcast transcripts and ways that I’m trying to make them accessible. This store is going on sale for both Black Friday and Cyber Monday. And everything’s gonna be 30% off, which means $14 t-shirts and $11 mugs and all sorts of other things at 30% off prices! So there’s going to be cell phone cases and tote bags and notebooks and stickers and pillows and wall hangings and a lot of other clothing items in addition to t-shirts. So if you’re doing holiday shopping on either of those days, check out the Writing Alchemy store. Just follow the link in the show notes. In this Bonus Cast I share the stories behind three of the sound effects I used in the most recent episode of Owlbear Reintroduction Program Game. Following these stories are updates on what is going on for me, what I’ve been doing for the past two months, and what projects and podcast episodes are coming next. It really means a lot to me to get this bonus cast up for all of you. As you may have noticed I am not yet back to regular podcast updates. I wanted to give you something fun to listen to and let you know what is going on. I hope you enjoy it! 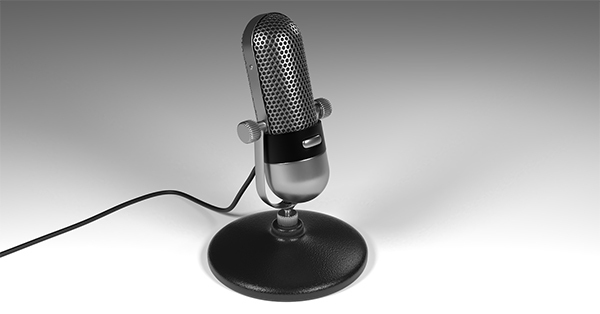 Photograph of a silver and black desktop microphone sitting on a white surface with its black cord trailing off to the left. Bonus casts are something that I want to be doing from time to time. This will be a great way for me to share some interesting thoughts, behind the scenes tidbits, and fun pieces of world building. If you have any questions or topic ideas, please send them my way. I’d love to hear from you! Fay Onyx: Hello and welcome to Writing Alchemy Bonus Cast Number Six. I’m Fay Onyx and in today’s episode I’m sharing the stories behind three of the sound effects used in the most recent episode of Owlbear Reintroduction Program Game, followed by updates on what is going on for me, what I’ve been doing for the past two months, and what projects and podcast episodes are coming next. Please note that in the discussion of these sound effects there will be some spoilers for Unfamiliar Heroes Episode 18, which is Part 5 of The Owlbear Reintroduction Program Game. Before we get started, I’m going to quickly mention that you can follow Writing Alchemy on twitter at Writing underscore Alchemy, hashtag AlchemyCast, and on facebook at facebook dot com slash Writing Alchemy. You can find the show notes, complete with all of the music and sound effect credits, on Writing Alchemy dot net, where you can also find all of my podcasts, articles, stories, and other content. And if you want to help me keep this podcast going, you can pledge your support on patreon at patreon dot com slash writing alchemy, or make a donation through Ko-fi. So, I get all of my sound effects at Free Sound dot Org, and some of them are pretty straight forward to find and use. But others end up being more complicated. Here are the stories behind three of the sound effects that I used in the most recent episode of the Owlbear Reintroduction Program Game. When searching in the Free Sound database, it can be surprising which sounds are easy to find and which are hard to find. One that really surprised me was how hard it was to find a good dripping sound for water dripping off a person onto the ground. This is for the scene where D’Zân uses a water jet to push back some zombies and starts spinning out of control and accidentally sprays everyone with water. So this is the sound effect of everyone dripping water onto the ground that is used to highlight this comedic outcome of events. It turns out that if you enter the keyword “drip” into the Free Sound search engine it comes up with seventy six pages of sound effects. That is a total of 1911 sounds. I’m going to start by saying that it isn’t inherently wrong to create game mechanics that treat disability as a limitation. However many of the mechanics that exist create dynamics that reinforce negative ideas about disability. The most common problems are mechanics that fail to represent important experiences of disability, don’t represent disability accurately, create an incentive for players to engage in stigmatizing play, push players into portraying disabilities that they don’t know anything about, and use derogatory language for disability. Altering, replacing, or removing these game mechanics makes it possible to create disabled characters that are empowering and realistic representations. This is something that a lot of folks outside of the disabled community are unaware of. The way that I like to explain it is that there are two ways to experience disability: as a limitation and as a neutral difference. To illustrate this I’ll use myself as an example. I have a chronic back condition which I experience as a limitation because it prevents me from doing things like lifting heavy objects. At the same time, I experience the way my brain works as a neutral difference. My brain is very good at taking in a lot of information and quickly thinking through many options. This ability is a great strength when it comes to analyzing and planning, but it also causes me to have anxiety. However, just because I experience my unique anxiety-producing brain as a neutral difference, doesn’t mean that others with anxiety feel the same. For many people this is an individual and deeply held experience. When a person with a disability wants to play a character with the same disability, it can be painful to have such a significant experience invalidated. Mechanics that only treat disability as a limitation run into this problem. Traits associated with specific disabilities are regularly used to make monstrous and evil creatures seem more creepy, frightening, or disgusting. For example, disability associated traits like hunchbacks, non-normative limb shapes, and joints that bend in unusual ways are often used to make demons appear misshapen and deformed. Giving monsters traits associated with real disabilities sends a negative message about what it means to have those traits. This is particularly so when the disabled trait is being used to make them the monster or villain more intimidating. Not only does this reinforce negative ideas about disability, this also results in harassment and mistreatment of people with these traits. For example, Elsa S. Henry, a prominent disability activist and game designer, grew up being called “an evil witch” by her classmates because of the stereotypical association of cataracts with evil (story recounted in “Accessibility with Elsa S Henry” on the Modifier podcast). As with any kind of automatic transcription, the transcripts that Otter produces will have many errors in them and little punctuation. However, editing a transcript is less work than transcribing from nothing. In addition, Otter’s transcript editor has tools that make the transcription process smoother and faster. The technology in Otter is designed to learn over time, which means that more you use it the more accurate it should become. Because Otter is an app designed to transcribe meetings in real time, it has a lot of potential as an accessibility tool for gaming. Otter offers ten hours of free transcription per month and one hundred hours of transcription $10/month. The following are my step-by-step instructions for using Otter to create podcast transcripts. I am using Windows on my computer, so they will be most exact for Windows users. Sign up for a free account at https://otter.ai by clicking the button that says “Get started now, its free.” There will be the option to sign up with google or to fill out a form. If you use a google account it is easier to use features such as transcript sharing. You have the option to “Help Otter learn your unique voice” by clicking on the button in the center of the screen or to click on the “Skip this step” link in the upper right of the screen. If you do this step, this test recording will end up in the app for you to experiment with. Next you will have the option to “Sync your calendar and contacts” by clicking on the “Sync your google account” button in the center of the screen or to click on the “Go to the app” link in the upper right of the screen. This step is not necessary in order to use Otter for transcription. You should now be in the app. From tabletop role-playing games to comics to board games to twitch channels, there are lot new and exciting geeky projects being produced by creators big and small. However many of these projects aren’t fully accessible to disabled participants and audience members. The best way to change this is to get people with disabilities involved in creating these projects. 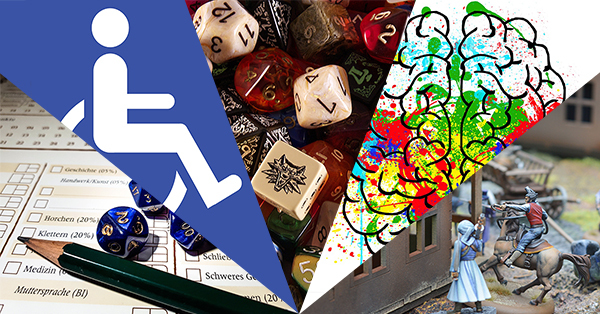 The Disability Consultants for Geeky Projects List is designed to raise awareness of the many people doing this important work, help people connect with each other, and help creators find disability consultants who are a good fit for their projects. To be added to this list, please fill out this form.